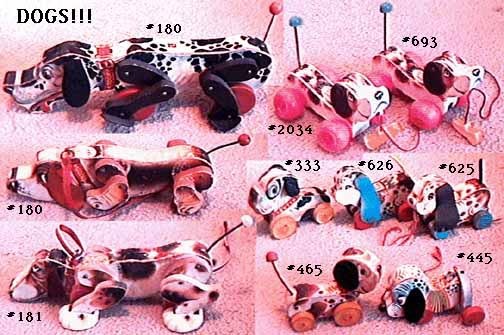 Description: The #626 Playful Puppy is the same as 1961's #625 Playful Puppy except for the color. Just like the #626, this playful puppy just can't get enough of his old shoe! When pulled, he wags his tail, turns his head from side to side slinging his shoe all around, and he makes a playful "grrr-grrr" sound. FPT4301 - Small wooden cut-out dog with paper lithographs on the sides and edges of a white dog with black spots, blue eyes, and a black nose. The dog has a long yellow plastic tail, a yellow shoe attached to his mouth via red string, and he rolls on 4 red wooden wheels. He has 2 long blue vinyl ears that are connected to the 2 front wheels and makes puppy's head turn from side to side when the toy is pulled. Puppy also makes a "grrrr-grrr" sound and his tail wags as he is pulled. Measures 7" long, 2-3/4" wide, and 5" high. Also see 1961s #625 Playful Puppy. Also see 1966-1989's #693 Little Snoopy for another dog with a shoe hanging from his mouth.